Charlie Dooley and Steve Stenger join us on St. Louis on the Air ahead of the Aug. 5 primary for St. Louis County Executive. (We will also have the Republican candidates on the program on July 29) Join in the conversation here with your comments and questions. Create jobs? @SteveStenger says he will focus on workforce development and corporate infrastructure. Cites @googlefiber as example. "Within my first 100 days ... we are going to begin work to bring (@googlefiber ) to St. Louis County," says @SteveStenger . Steve by his record is an effective council member the leadership issue on Google Fiber is about how many municipalities have to make the deal work beyond St. Louis county so what would Steve do to bring these municipalities together. "That means going to @google ," says @SteveStenger . "I can present the case to Google." Stenger says his plan to build the county's economy would focus on workforce development and corporate infrastructure. Repeats how he wants to bring Google Fiber into the STL area. Would Google Fiber be enough to help STL County's economically languishing areas? Stenger says there's common ground about "cooperating" with STL City. Says he supported the partial merger of the STL City and STL County ecodevo agencies. City/county merger: "I think it's very important to not make a political decision," says @SteveStenger . Stenger says it's "important not make a political decision" about whether to merge STL City somehow with the county. Says more studies need to be done and there needs to be a specific proposal. City/county merger: @SteveStenger says he thinks it will be decided by city and county voters, and wants to see data on it. Marsh: Can somebody have an opinion on the city-county merger without a study? City/county merger: "We need to proceed with caution," says @SteveStenger . Stenger: "I don't think at this point that the issue is far enough along to make a determination one way or another." "Being the county executive is not going to give you the perspective you need to assess" the city/county situation, says @SteveStenger . Talk of a city-county merger has been talked about for decades. Does somebody need the Better Together study to be completed in order to make a determination on whether it's philosophically a good or bad idea? No debate? "I have accepted every debate challenge," says @SteveStenger . Both Rick Stream and Tony Pousosa have said they oppose a city-county merger. So there's that. "I was asked to produce my federal tax returns," says @SteveStenger . Provided returns for 6 years. "That should not be a (debate) hindrance"
Stenger says he will vote for Amendment 7. #STL county executive Republican candidates @rickstream and @TonyPousosa will join us July 29. Transportation tax: "It's not my favorite," says @SteveStenger , but says he supports it. Right to bear arms amendment: "I think that's already covered," @SteveStenger says. "When the ads started ... those were disturbing to me," says @SteveStenger . "I believe my ads have been factually based." On Thursday, we'll be talking about beer and baseball, including @TonyLaRussa 's induction to @BaseballHall and @Cardinals legacy. Thanks so much to all of you for joining us for today's live chat. We'll have a recap and more on stlpublicradio.org later today. Again, we'll have Republican candidates Rick Stream and Tony Pousosa on with us on July 29. That's it! Thank you for joining us on this live chat. August 5 is not too far away. 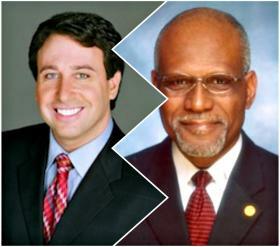 Thanks for joining us for today's interviews with @CharlieADooley and @SteveStenger . Miss it? We'll post the show online in a few minutes.